As winter’s cold continues in the beginning of the year, many people look forward to the “Spring Season” especially gardeners who plan to landscape their homes or create unique gardens for their property. 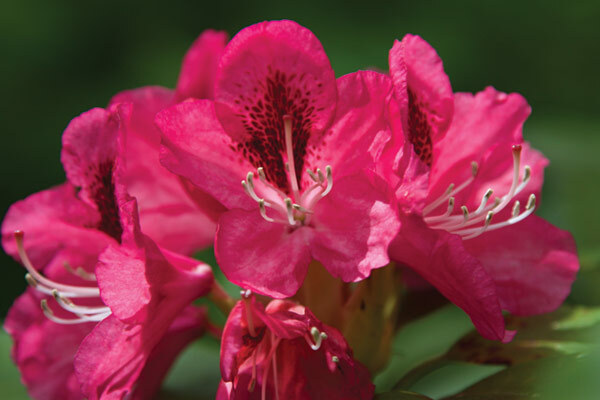 Among the most popular garden shrubs are azaleas and rhododendrons that are known for their spectacular spring flowers. In winter some stand out with large evergreen leaves, then spring shows beautiful flower blooms and in fall the leaves add a pleasing, deep green color to the garden. One of the area local experts on how to care for these magnificent blooms is Hamilton Gardens at Lake Chatuge in Hiawassee, GA. Hamilton Gardens is an official State botanical garden with the largest collection of rhododendrons and native azaleas in the Southeast. The Gardens have approximately 33 acres, 1.5 miles of mulched trails that include more than 2,000 rhododendrons and native azaleas and is open to the public year-round. One of many events for Hamilton Gardens is a program called “Let’s Get Growing” that conducts public lectures in the summer. Additional projects include area schools and colleges to developing plans with Horticulture students and creating volunteer work programs. Educational programs help the community preserve flowering shrubs, wildflowers and hardwoods indigenous to the Appalachian Mountains. • Azaleas need to planted in partial shade and do best with morning sun and afternoon shade. A site sloping to the north or east is usually best to protect from drying south and east winds, and from rapid temperature changes in late fall or early spring. • Spacing needs to be factored in when deciding where to plant azaleas. If the mature plant will grow to under 3 feet tall, space the plants 2 feet apart. If over 3 – 5 feet tall, leave at least 30 inches between each plant. •Companion plants, whether bulbs, shrubs or perennials, should be selected to require the same growing conditions as the azaleas. • While it is possible to prune these plants anytime from early spring to early summer it is recommended to prune is immediately after blooming. This is because the plants begin to form next year’s blooms soon after shedding the current year’s flowers. • Mulch plants every spring with 2 to 5 inches of pine bark chips or pine needles to protect shallow roots, retain soil moisture, and keep the soil damp. • Established azaleas typically do well without additional fertilizer if azaleas are kept well mulched. If you do fertilize, it is best to apply it between late fall and early spring when plants are dormant. Gardens is a 501©3 non-profit organization. A walk through Hamilton Gardens will leave you breathless and inspired. The Gardens are open year round and are located at 96 Pavilion Road in Hiawassee, Ga.
Saturday, May 4th from 7am – 10 am at Chatuge Regional Hospital. Pre-Registration Mon-Fri the week of May 4th from 8am – 4:30pm. You may pre-register for lab work at hospital information desk. FREE Screenings & Reduced Cost of lab work offered: PSA • Breast Exams • Bone Density • Vision & Hearing Screenings. Information on: Home Health Agencies • Rehabilitation • Hospice Agencies • Home Care Equipment • plus Much More! Vendors and refreshments.